The plastic ring that comes attached to the lid of your milk jug can provide hours of entertainment for your cat. There is no extra cost for this toy! These are especially fun on uncarpeted flooring where they can easily slide around. Toss it or roll it to the kitty and let the fun begin. 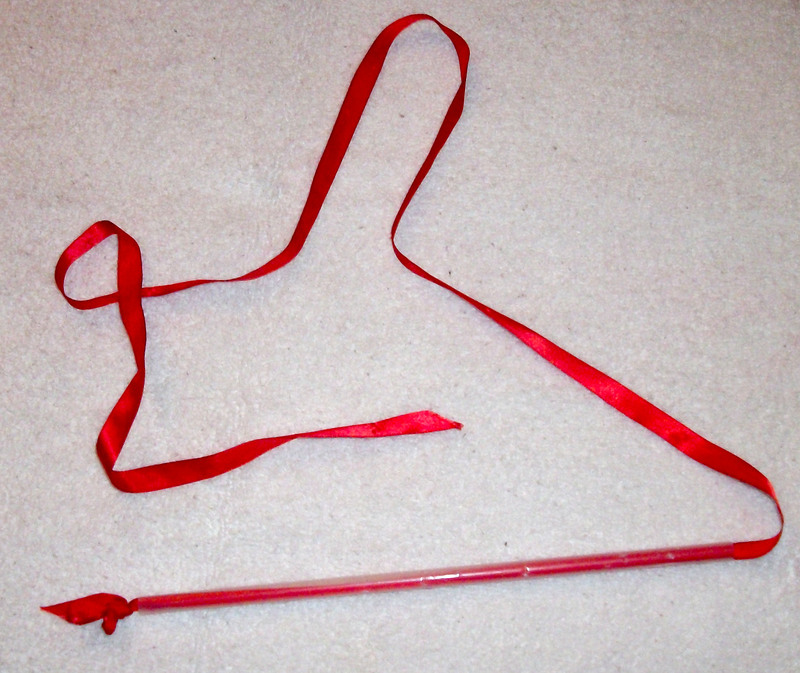 These can be used independently by the cat or as toys for interactive play. Every time you purchase a fountain drink from a local fast food restaurant or party store you receive these. They can also be purchased inexpensively at most grocery stores. If it came with your favorite drink, simply give it a good wash and it’s ready to become a cat toy! 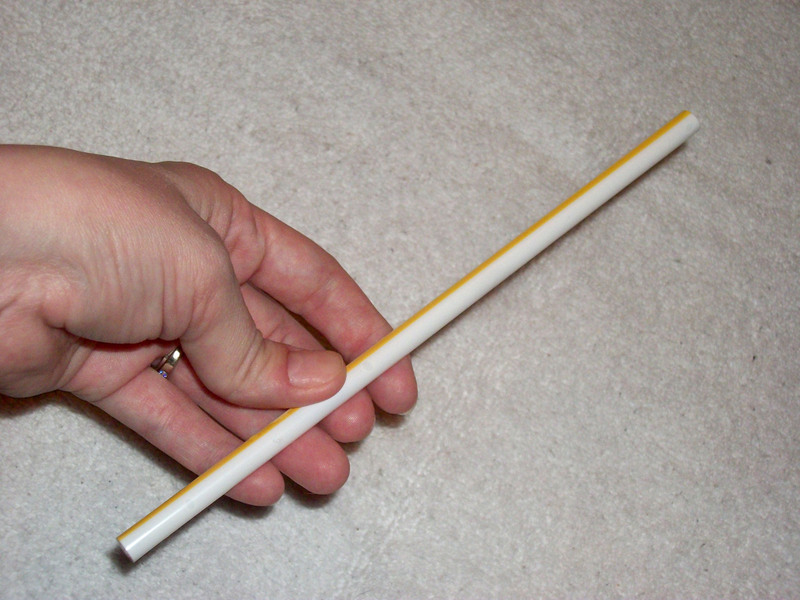 Straws are best used as interactive toys. Wriggle the straw around in front of your cat as if it were a mouse’s tail. 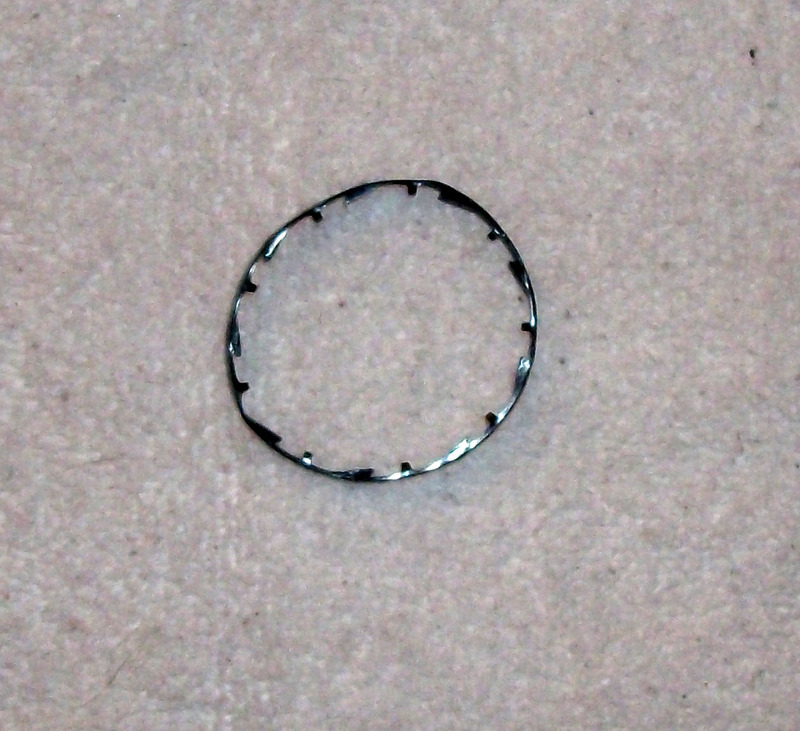 Move it around underneath a bed sheet or poke it out from under a pillow or couch cushion. Cats love to capture straws! If you are a crafter, you probably have a few spools of ribbon sitting around. If you aren’t too picky about the color or brand, it is pretty easy to find cheap spools of ribbon at craft stores and in garage sales. I like to cut a piece of ribbon that is long enough to drag a few feet behind me if I hold it in my hand while I am walking. Just hold one end of the ribbon and walk slowly, letting the ribbon drag past your cat. It makes a great chase toy! You could also sit in one spot, have the ribbon stretched out across the floor in front of you, and pull the ribbon toward yourself in an uneven rhythm. As a bonus, you can place a disposal plastic straw over one end of the ribbon and tie a knot in the ribbon so the straw doesn’t come off. Cats have an easier time grabbing and manipulating the straw than just the ribbon itself. Ribbons are an interactive toy only – don’t leave this out where your cat can get to it unsupervised. Wad up any piece of paper and let ‘er rip! Junk mail works great! Just make sure that the ball is small enough and balled tightly enough for your cat to bat around easily. Cinco and Manna also like balls of aluminum foil. If you are lucky, you may even get a good game of fetch going with one of these awesome toys. You can lace them with catnip too if you don’t mind a little nip on your floor. If you have a paper licker/eater, you may want to stay away from using paper that has ink on it. Otherwise, balls of paper are good for independent or interactive play. This doesn’t really need an explanation with all of the photos out there. Cats love to play with boxes. It doesn’t really matter how large or how small the box is. You can even put them together and cut holes between them to make “tunnels.” Boxes tend to be an independent toy, but there are ways to use them for interaction.To make this toy interactive, try using a disposable plastic straw to peek up over the edge of the box while the cat is inside. Any paper bag will do; the ones that you carry groceries home in, the one from your favorite department store, the ones you use when you take a lunch to work, etc. 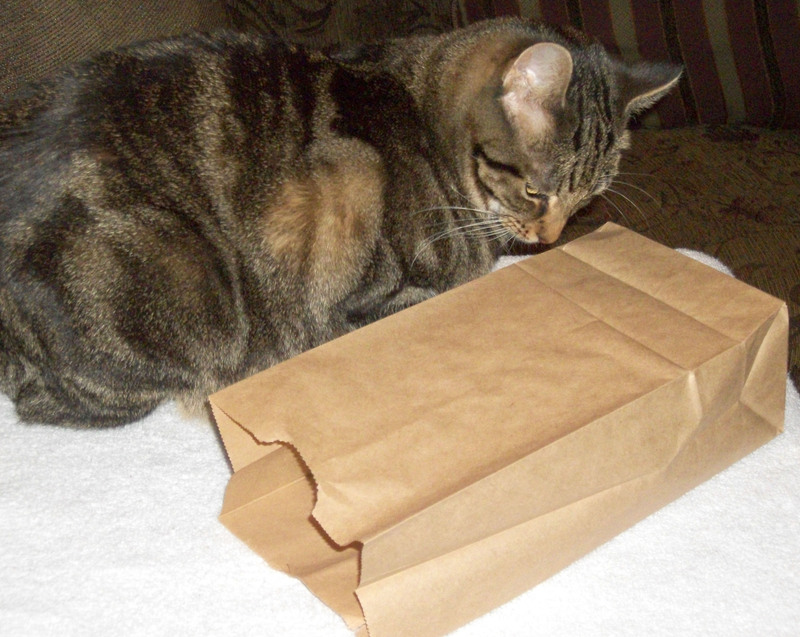 Cats love the crinkle of paper bags. These can work in the same way boxes do, but they can allow for a little more interaction because you can actually poke the cat through the bag. As I’ve mentioned before, it is fun to put a cellphone on vibrate inside a paper bag and call it from another phone. Cats love to try and figure out what is inside the bag. Paper bags can be used for both independent or interactive play. Plastic bags are not recommended because of the potential for suffocation. Okay, you may not have this at home already. However, if you don’t need anything fancy, you can find simple laser pointers for under $10. 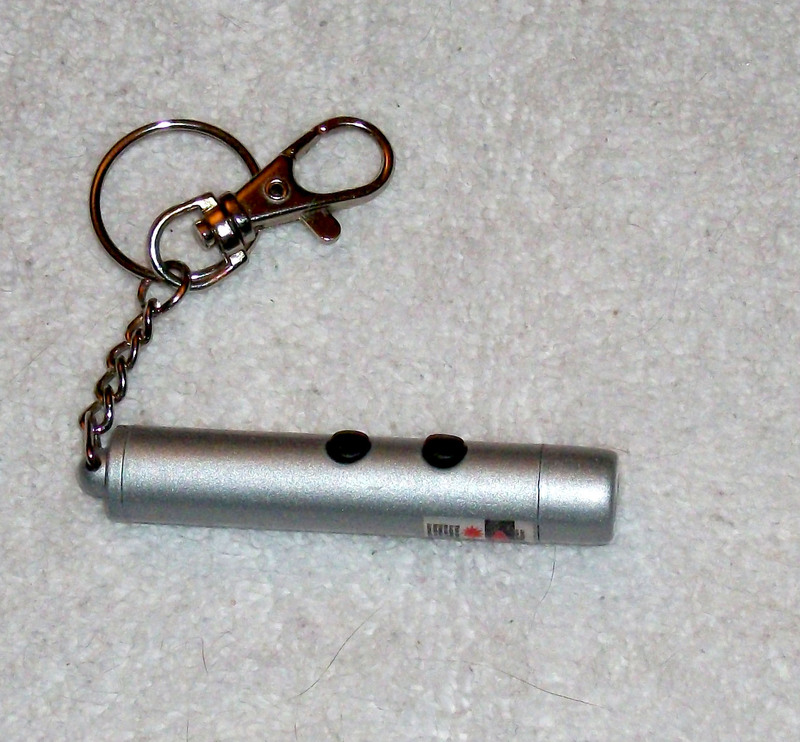 Here’s one at Walmart for $6.56 : Ethical Pet Single Dot Laser. Let that little Red Dot race around the room and your cat will follow. These simple lasers are interactive only by nature of the product. There are more expensive versions available that will turn on and play with the cat for you. 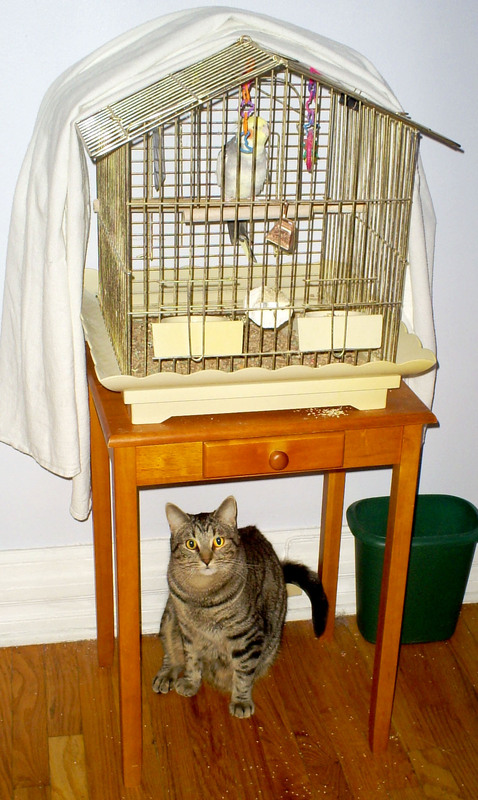 Feathers can be found inexpensively in craft stores and free in the homes of bird owners. I am not suggesting that you pluck someone’s bird, just that you ask them to save any long feathers that the bird plucks out on its own. Birds make feathery messes every day. I’m not suggesting the feathers of wild birds either because you don’t know what germs, diseases, or parasites might be on them. Feathers are used much in the same way that disposable plastic straws are used. Touching the feather to the cat’s nose or paws can be fun too. Feathers are much more fun as an interactive toy than a independent toy. A few years ago we had visitors with a baby and my cat Chris stole the baby’s pacifier. Not just one. He pulled the zipper open on their diaper bag and pulled out another one. After that we bought a couple more just for Chris and he played with them all the time. These are all great suggestions! Cody has never been a fan of the milk ring but most cats are. Glad you showed paper bags without handles, I cringe when I see cats playing with bags with handles, the cat’s neck can get caught in them and they an choke. Another super fun “toy” is to take a sock (or nylon knee high) that has no mate, (we all have them! 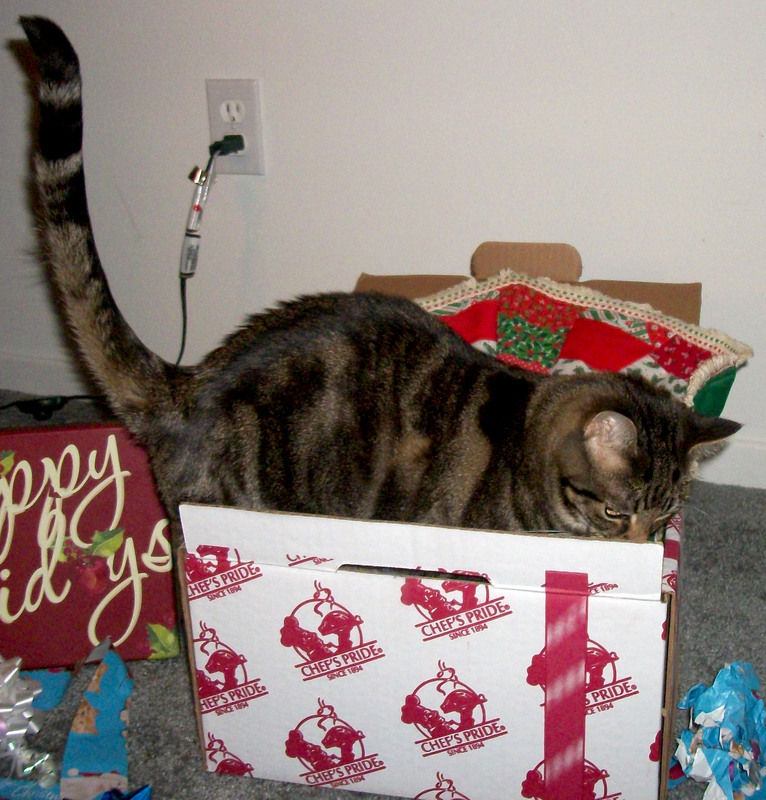 ), put catnip in them, tie a knot by where the catnip is to “seal” it and let kitty go to town! It sounds like you guys have all kinds of fun! Bag ties are a hit around here too. I haven’t tried bottle caps yet, but that sounds like lots of fun. Thanks for the ideas! Great suggestions! Some of them would be fitting for dogs, if only the dogs didn’t try to eat them. Thanks! You’re right – dogs need tougher toys than kitties do. I love to play with the corks from the wine bottles… no it’s not me that makes them drink! It isn’t is it? We have had lots and LOTS of fun with the *toys* you mentioned. Although ribbons are now banned since Felix ate one when Mommy wasn’t looking. Thankfully, a week later, the mystery as to why Felix was feeling so poorly was revealed from his other end. Yikes! I can see why your mommy would ban ribbons. Sometimes kitties do things we don’t anticipate them doing. Doggies do too. I have a friend whose dog just at $600 in cash last night. My friend is not happy with her. You nailed it! We love all of those things, except we can’t have ribbon…I try to eat it. Thank you! Ribbon looks awfully tasty to cats sometimes. At least there are plenty of other great toys for you to play with! I was shelling walnuts one day when one fiell off my lap onto the floor. My cat Dougy immediately chased after it, batting it around like a soccer ball. haha! Cats do play with the strangest things! thats for sure! Great tips on toys for them! And my cats always play with everything you mentioned! Thank you very much! Cat’s are pretty easy to please 🙂 I wish people could be that way. Violet’s favorite toy are hair ties. If I try to hide them from her she will find them every time. Mikko’s favorite toy is a piece of string (Being dragged around by a brave soul LOL), and another fav of his is a straw. He will bat it around for hours, until he decides its time to eat it. LOL! PS: I cant figure out how to get a Navbar! Can you help? Those are some great toys! Sounds like Mikko is a pretty fun guy. What kind of a Navbar are you looking for? The one with all of the blog’s pages listed on it or one with all of the social media icons listed? Are you on wordpress?The one I have for the pages of my blog came with the theme I chose. This is a clever article! Thanks for visiting my FB page from the FB hop. I am not a cat person per se, but I did have a roommate once who had a cat that I loved (he thought he was a dog) and we used to love to play with the red dot and balled up paper worth him. This is a clever article and I enjoyed reading it! Thank you very much! I’m really glad you stopped by Playful Kitty 🙂 Sounds like you and your roommate’s kitty had a good time together. There are a lot of cats that think they are dogs LOL Sometimes I think it is the personality of the cat that makes the difference and sometimes I think it is they way the owner raises them that makes the difference. It’s hard to say. These are all great ideas! 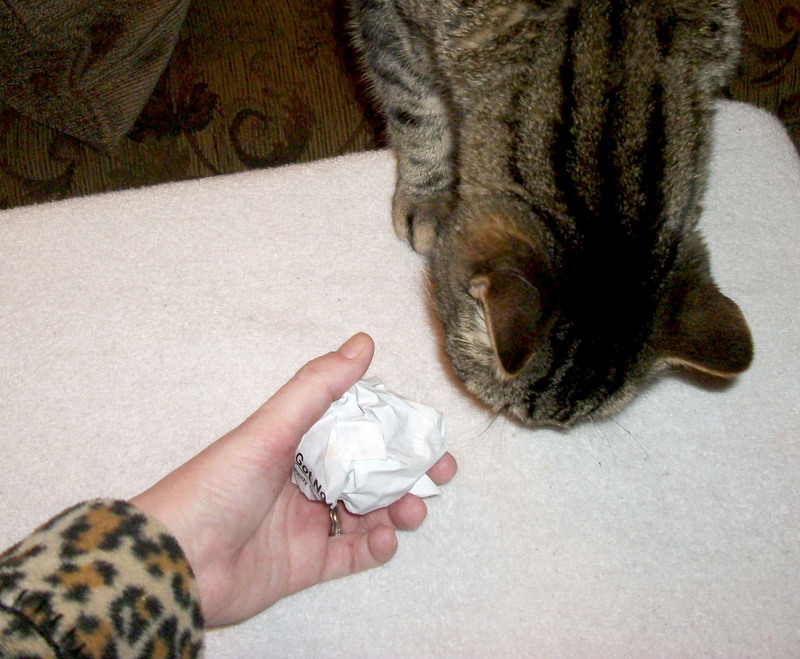 My cats go crazy for paper balls. My Sampson if particularly fond of paper towels and napkins. He likes to rip them apart. This creates a mess for me to clean up of course, but he enjoys it!